Watch out Adobe! 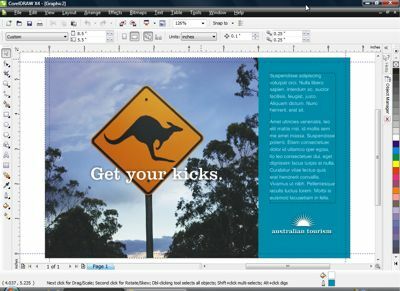 With its 14th version of its CorelDraw Suite of applications, the Ottawa, Canada-based company has once again thrown down a gauntlet in the page layout, graphics creation and manipulation application market. 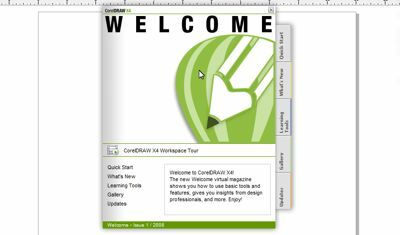 CorelDraw has been a main adversary for Adobe's design/layout applications for many years, going head to head with Illustrator, Photoshop (the application, if not the verb) and PageMaker/InDesign. It's a powerful and sophisticated suite that has grown into a real tour de force, offering increasingly easy interfaces and more thoughtful features with each version. Corel says the new suite offers more than 50 upgrades or significant enhancements over version X3 (which in a less silly world would perhaps have been called version 13, since it followed 12). Together, the apps can help you create anything from logos, web displays and multiple page brochures, to signage and digital displays. It features new text and page-layout enhancements, enhanced file format compatibility, and expanded clipart, photo and font content, just for starters. 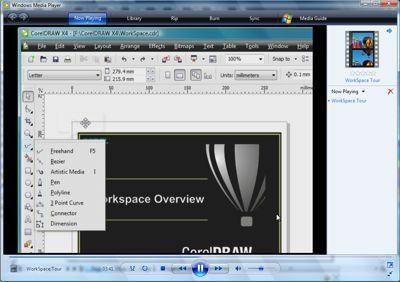 The Suite includes powerhouse apps CorelDraw and Photo-Paint, the former of which is for design/layout and vector graphics creation, with Photo-Paint the Photoshop competitor. I'm only a hack of a designer, but I've always found Corel's versions to be more user friendly than Adobe's, if only because of their more extensive use of customizable toolbars put the things I use most where they'll jump out and bite me. The other major applications are Corel Capture, which lets you create (some might say "steal") graphics from your computer monitor, either the whole screen or an area you choose yourself, and PowerTRACE (formerly Trace), which lets you turn bitmaps back into editable vector graphics. They've even enhanced the installation and training process, with handy preview hints you can peruse while the suite installs (assuming you sit there and watch it rather than go and do something else) and 18 training videos that come on the installation DVD. The "what's new" tips are also available from the startup screen and the "help" menu after installation. One of the things I like about Draw is that it lets you lay out a document and design graphics for it, right inside the document rather than having to use different apps for the different jobs. Kind of "one stop shopping" for content creators. Corel has optimized the suite for both of the people who still love using Windows Vista, and claims it's the only professional graphics suite Certified for the OS (though they also say it's still a "superior experience for Windows XP users"). For Vista users, this means the site integrates with Vista's handy desktop search capabilities directly from the Open and Import dialogue boxes, letting you search for files by author, subject, file type, date, keywords, etc. And you can add your own keywords, ratings or notes when saving files to help you organize projects better. I've always wondered what it would be like to be organized. Major new features include Live text formatting, which lets you preview your text options before actually applying them to your document. It's pretty cool: you can preview different fonts, font sizes and alignment settings, without going through the trial-and-error (and often, at least in my case, the inevitable "undoing with major cussing") of trying to find just the right look. It may not sound like much, but I love it. Also new is "Font identification" which means the suite now integrates with the online font identification service "WhatTheFont" online from MyFonts.com. So what? Well, it's meant to be a time saver, because it supposedly lets you identify a font that's used in an existing bitmap image, so if you can't tell if your new client's logo uses Times New Roman or Arial (Well, if you can't tell that perhaps you need a different gig, but you get the idea), this little critter will tell you. Or so they say. I didn't mess with it a lot, but it blew the three quick examples I tried, though it was fairly close on one of them. You can now control and/or edit layers on each page independently, which means you can create different layers for different pages as needed, a nice bit of flexibility. And a new, interactive Table tool lets you create and import tables – aligning, resizing and/or editing tables and cells to your own parameters. 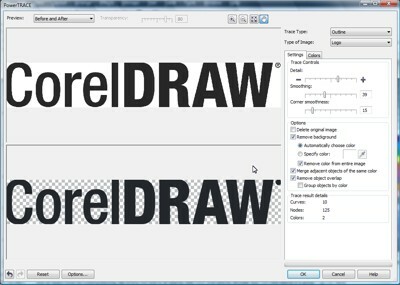 Draw now supports the Microsoft Office Publisher file format and is also compatible with Microsoft Word 2007, Adobe Illustrator Creative Suite 3, Adobe Photoshop CS3, adding these capabilities to its earlier support of such formats as Adobe Acrobat and AutoCAD, compatibility I've found very handy on past projects (such as designing audio/video placement locations for restaurant/pub layouts created in AutoCAD). Photo-Paint which, like PhotoShop, is proof that photographs shouldn't be allowable as evidence in courts of law anymore, now comes with RAW camera file format support that lets you import images right from a digital camera. Corel says they support about 300 different camera types and provide real-time previews you can use to view file properties and camera settings, adjust image color and tone, and improve image quality overall. A new Straighten Image feature lets you align images that were scanned or photographed at an angle. It uses a grid with vertical and horizontal guidelines and an integrated histogram. And the enhanced Tone Curve dialogue box, means you can adjust your images more precisely, getting real-time feedback as you mess around. The Eyedropper tool, which lets you lift colors from existing objects, has been enhanced as well. There's more, including 80 customizable templates that can help get you going. I'd have liked to see many more and of a broader variety, but I suppose creation is what the suite's all about and that means you should be following your own muse. The templates come with Designer Notes with information on why certain choices were made for a particular template; there are also tips for outputting your design and instructions for customizing the template while adhering to accepted design principles. That's something I can use! The suite has always included an abundance of fonts, clipart and photos, and X4 is no different. This time a specialized collection of fonts (including single-line engraving fonts and OpenType cross-platform fonts) offers enhanced support for Latin, Greek, and Cyrillic outputs in WGL4 format. If you need such things. The product also comes with more than 10,000 clipart and digital images: (4,000 new images, plus 1,000 high-resolution digital photos and 1,000 OpenType fonts). I liked the video lessons, which show you such things as fundamentals of illustration, design, and image-editing, industry-specific design principles, and more. The new ConceptShare docker is an online collaboration tool you access directly from within the workflow. Using a Web-based environment, it lets you share your designs and ideas with colleagues or clients in real time (thereby getting feedback – or, cynical me, getting ripped off!). You can create multiple workspaces, upload your designs, and invite others to opine on them or, if they think they have a better idea, to submit their own ideas without having to send large files via e-mail, (which can be a real pain and is sometimes impossible, depending on your situation). I use the CorelDRAW suite all the time. As a ham-fisted designer with pretensions of competence, its built in aids are a real help, and having seen some of the beautiful designs real artists have created using it, I know it's also a powerful tool for those who actually know what they're doing and have the talent to exploit the software. 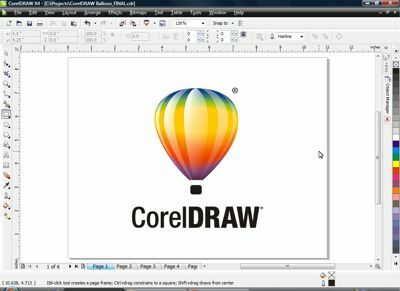 The CorelDRAW Graphics Suite X4 lists at $429 U.S. for the full version and $199 U.S. for the upgrade. It’s available in English, French, German, Italian, Dutch, Spanish, and Brazilian Portuguese. I haven't heard whether or not they're working on a pig latin version.